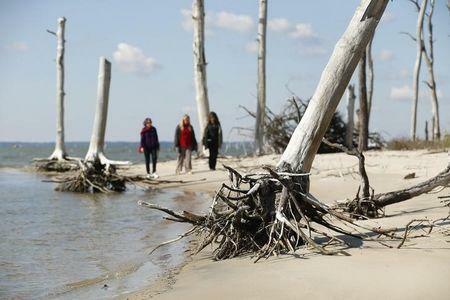 OSLO, Jan 14 (Reuters) - Sea level rise in the past two decades has accelerated faster than previously thought in a sign of climate change threatening coasts from Florida to Bangladesh, a study said on Wednesday. The report, reassessing records from more than 600 tidal gauges, found that readings from 1901-90 had over-estimated the rise in sea levels. Based on revised figures for those years, the acceleration since then was greater than so far assumed. The new analysis "suggests that the acceleration in the past two decades is 25 percent higher than previously thought," Carling Hay, a Canadian scientist at Harvard University and lead author of the study in the journal Nature, told Reuters. The study said sea level rise, caused by factors including a thaw of glaciers, averaged about 1.2 millimeters (0.05 inch) a year from 1901-90 - less than past estimates - and leapt to 3 mm a year in the past two decades, apparently linked to a quickening thaw of ice. Last year, the U.N.'s Intergovernmental Panel on Climate Change (IPCC) estimated the 1901-90 rate at 1.5 mm a year, meaning less of a leap to the recent rate around 3 mm. John Church, a top IPCC author at the Commonwealth Scientific and Industrial Research Organization in Australia, told Reuters he did not expect any impact on the IPCC's core sea level projections, which are not based on past trends. The new findings confirm that "sea level is rising and ... the rise has accelerated, with the most recent rates being the highest on record," he told Reuters.